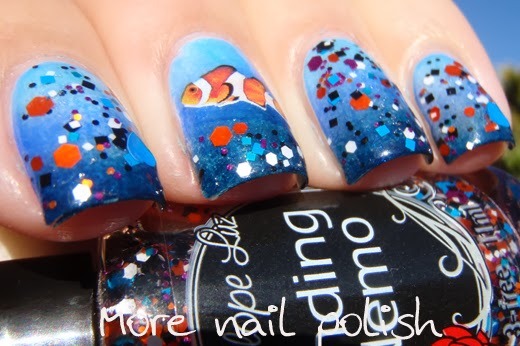 When I received this Penelope Luz polish last year, I knew that I wanted to incorporate it into some nail art, but after seeing so many gorgeous nemo manis around the interwebs, I was worried about the state of any clown fish I would be painting. 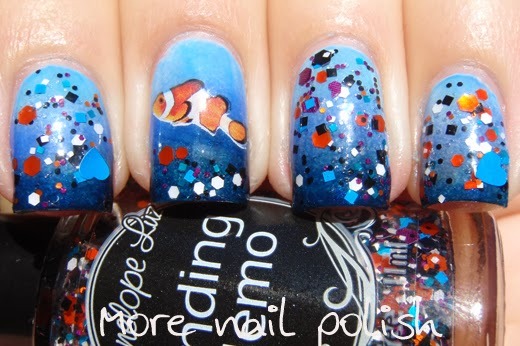 Then I came across some water decals on the Born Pretty Store that had various little fish on them, including clown fish. The water decals worked perfectly and are only 99 cents, and you get so many different fish that you could do lots of different under the sea manis. I created a gradient over white using OPI No room for the blues, Ulta3 Blue Marlin (how appropriate!) and Ulta3 Pacific Splash (seriously, could these polish names be a better match for this mani). I then did two thin coats of Penelope Luz Finding Nemo, which contains red, blue, white, black and dark purple glitters in various sizes. 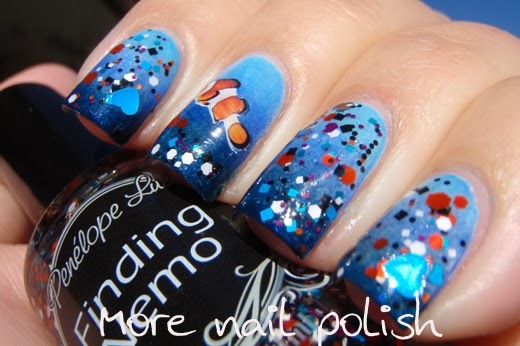 I placed the smaller Nemo clown fish decal on my middle fingers, and the larger Marlin one on my thumbs. BTW, not sure if you know this or not Cathy, but I came across a blog which looks to be the exact copy of yours: http://morenailspolish.blogspot.com.au/. What a great idea! The decal looks awesome over the blue and the hearts really top it off appropriately. 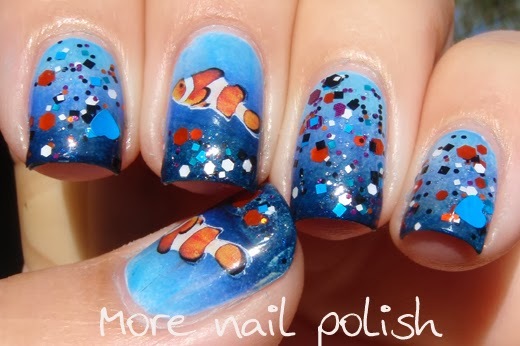 This looks soo creative on your nails! This is such an immaculately done manicure!